First up a bit about me, I am dyslexic. My kids know never to ask me to spell things for them (My wife warns them not to regularly). One thing with my dyslexia which I find really annoying is that I miss out words when I am typing. As good as spell checkers are they do not know what I was wanting to say, which means they are not that good at pointing out missing words. The other thing spell checkers are not that good at is telling you when you have a correctly spelt word but it’s the wrong word. Usually for me that means that I have spelt it so badly that it’s something completely different! When I was at school I was taught to leave a document for 30 min then proof read. Waiting means the brain is less likely to fill in the missing words and I am more likely to pick up mistakes. I now have a new tool to add to my kit bag thanks to @nzregs from Microsoft!! Use the Speak function in Microsoft Word and Outlook to read back what I have typed. I have been trying it this week and I have been super impressed with the results. It seems that while my brain adds missing words when I read documents, listening to Office read back my email or document, allows me to pick up almost all of the missing and incorrectly used words. 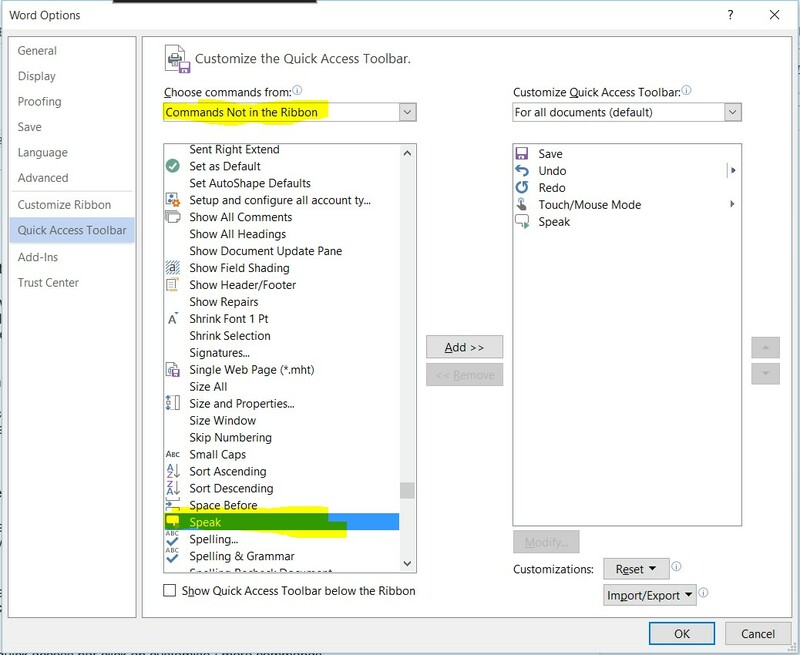 Simply highlight the text you want Office to read back and click on the speak icon.